ifoAppleStore reports that a "select group of Specialists will be wearing and promoting the (RED) iPod nano" to mark the day set aside for international AIDS awareness. Apple sells 8GB and 16GB (RED) iPod nano models for $129 and $149, the same price as other models. A portion of the purchase price goes to the Global Fund to fight AIDS in Africa. 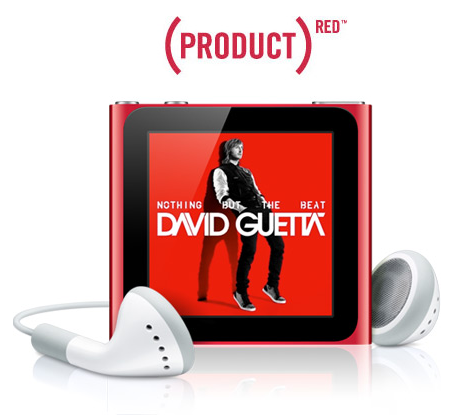 The company also offers a (RED) leather iPad Smart Cover, Special Edition (RED) Beats by Dr. Dre Solo HD Headphones. A (RED) iTunes gift card is also rumored to be reintroduced at stores. Managers will also reportedly use the (RED) Smart Covers for iPads as they go about their work on Thursday, and product shelves will feature signs promoting the Beats headphones, the report noted. The Cupertino, Calif., released its seventh-generation iPod nano in early October. The device includes an "improved fitness experience," updated interface and a cheaper price. The (RED) project was created by U2 lead singer Bono and Bobby Shriver in 2006. Apple joined in later that year with a (PRODUCT) RED Special Edition iPod nano. Though Apple has at times been the object of criticism over a perceived lack of philanthropic endeavors, Bono praised late Apple co-founder Steve Jobs and the company in September for their contributions to the (RED) campaign. According to him, Apple has been the largest contributor to the Global Fund to Fight AIDS. Apple also initiated a charitable contribution matching program for full-time employees this September that pledges to match up to $10,000 worth of donations per year. AppleInsider reported last month that Apple had already matched $1.3 million with the program in less than two months.